Laurence McKeown is a former republican prisoner. He spent sixteen years in the H-Blocks of Long Kesh, was on the blanket protest for four and a half years, and on the 1981 hunger strike for seventy days. Laurence is currently an author, filmmaker, and playwright. He is currently working on a project We Wore The Blanket, the output from which will be a multi-media exhibition. 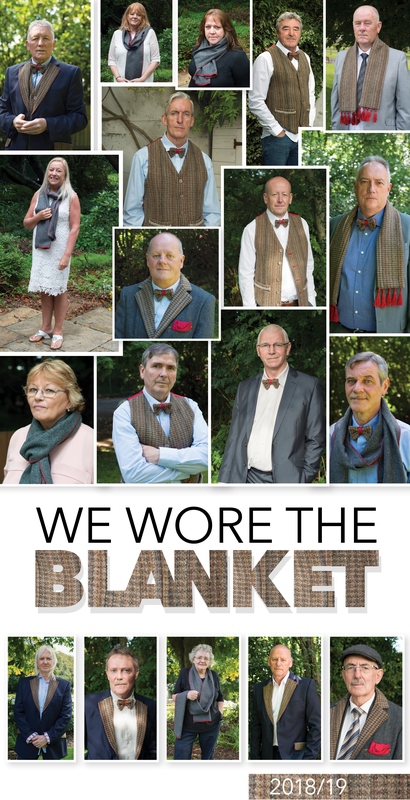 As part of that project Laurence has recently published a calendar featuring nineteen participants; male and female former prisoners who engaged in the blanket protest, and those who wore the blanket on the outside in support of the prisoners’ protest. Laurence describes (below) the origins and thinking behind the project. On 14th September 1976 Kieran Nugent, aged 18, became the first Irish republican prisoner to be sentenced under the newly introduced British Government policy of ‘criminalisation’. Kieran was already no stranger to prison. Aged 16, he had spent 5 months on remand in the Crumlin Road Prison and was 17 when interned without trial in Long Kesh for 9 months. When taken to the H-Blocks Kieran was stripped and ordered to wear the prison uniform. He refused. “You’ll have to nail it to my back,” he said. He was beaten and thrown naked into a cell where he wrapped himself in a blanket. Thus began the ‘Blanket Protest’. Hundreds of republican prisoners followed Kieran onto the protest in subsequent years. In Armagh Gaol, female republican prisoners were allowed to retain their own clothes but otherwise experienced the same conditions as their male comrades and struggled for the same objective – the return of political status. On the outside, relatives – mainly the mothers, wives, partners, sisters, and girlfriends of the prisoners – began to protest on their behalf. All of them together, whether inside or outside of a prison, became the ‘blanket protesters’. The protest ended five years later on 3rd October 1981 following the death of ten prisoners on hunger strike. The prisoners secured one of their demands – the right to wear their own clothes. Thus ended the ‘blanket protest’. In subsequent years, through a variety of campaigns and protests, all the prisoners’ outstanding demands were achieved. Intended to be the British Government’s ‘Breakers Yard’, by the late 1980s the H-Blocks became one of the most politicised guerrilla training and education camps ever seen in the history of the Irish republican struggle. To commemorate the 40th anniversary of the commencement of the protest I began an arts project. It will combine a range of artistic elements. It is still very much ‘a work in progress’ but a start has been made and even the longest journey begins with the first step! 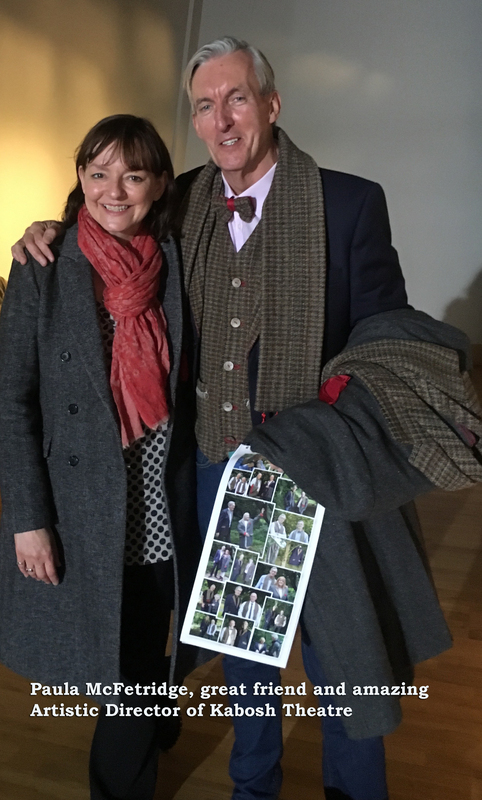 I had ‘obtained’ an original blanket from the H-Blocks when they closed in July 2000 and asked a professional dressmaker to make me a number of items of clothing from it; a bowtie, a tie, a waistcoat, a Crombie coat, and several scarves. I also requested she alter a dress jacket I had to include elements of the blanket. The idea was to subvert the usual image of the blanket protest – of beards, long hair, prison cells, street protests – by photographing a number of those involved in the blanket protest wearing these items of clothing. They would be elegant photos; photographs of people who were proud of the contribution they had made and who today ‘wear the blanket’ as a mark of honour. The photos were taken outdoors, amidst nature – grass, flowers, trees – in stark contrast to the grey concrete and steel doors of a prison cell. It was a soul-searching decision to decide to cut up the blanket but I wanted to transform it to the present day, just as I think the ‘Blanket Protest’ transformed life for so many of us and also altered the shape of politics and struggle on this island. Given the subject matter of the project it will not attract funding from any of the usual sources so this calendar is an attempt to recoup some of the monies already spent on it and to gather funds for the on-going development of the project. Being an Irish Republican the traditional calendar format had to be subverted, of course! 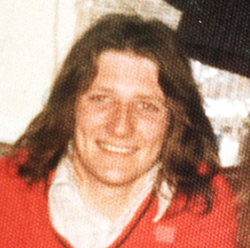 It does not follow the usual pattern of 12 months commencing with January and ending December but instead begins in March (the ‘criminalisation policy’ commenced 1st March 1976 and Bobby Sands began his hunger strike on 1st March 1981) and ends 19 months later in September 2019. I chose this time period as it takes in the hunger strike, the changes in the prisoners’ strategy and their modus operandi post-hunger strike, and concludes with the ‘Great Escape’ of September 1983. Many who had been on the blanket protest took an active part in the escape – either as escapees or providing the vital backup support – and whilst the hunger strike smashed ‘criminalisation’ the escape buried it. The contributors were drawn from those who came forward when I issued a public call in mid-2016. We held photographic sessions in Belfast, Derry City, South Derry, and South Armagh. Due to restrictions on time and space, not all those photographed in the initial sessions could be photographed again for the calendar but they will all feature in any future exhibition. My warmest thanks to everyone who gave of their time so willingly. Contributors: Feargal McGuigan, Séanna Walsh, Seamus Kelly, Jimmy Torney, William Doherty, Mary Nelis, Kevin McCoy, Sean McGuigan, Henry Cushinan, Kathleen McCann, Pius McNaught, John Hunter, Breige Brownlee, Sinéad Moore, Ann Marie Quinn, Éilis O’Connor, Laurence McKeown, Paddy Agnew, Paddy Quinn. The calendar is available in the Sinn Féin Arts and Crafts Shop on the Falls Road, Belfast, An Cheathrú Póilí bookshop in An Culturlann, Falls Road, and in Checkpoint Charlie Derry City bookshop. Copies can also be purchased directly by messaging Laurence on Facebook or email at laurence.mckeown@btinternet.com. Payment can be made either through PayPal (UK, or Ireland) or bank transfer. Anywhere else in the world – get in touch, we’ll figure it out! The calendar contains 11 pages, including the front cover which is laminated and is of a heavier grade which serves as the stiff back when the calendar is in use. The photo attached shows the front cover and the text that appears on the back of the cover describing the origins of the calendar and its place in the wider project. 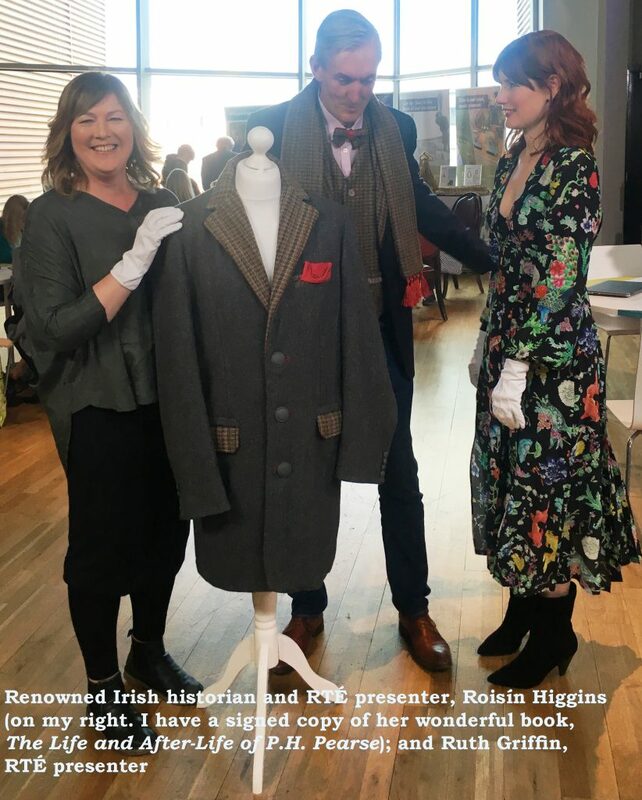 There is currently a project called ‘National Treasures’ being carried out by RTÉ and the National Museum of Ireland (https://nationaltreasures.ie/roadshows). I had heard about it the other day while travelling. They are going to various locations around the island photographing items that people take to them that are of historical and/or social value, or which tell a story and they were going to be at the Titanic Quarter, Belfast yesterday, the 22nd October. I had thought no more about it but then my friend, Paula McFetridge, encouraged me to take along the items made from the blanket. Paula particularly loves the waistcoat! I decided to do that and yesterday I went along to the event. I met Paula upstairs. She was there to take along the medals her mother won for being on the Antrim Camogie team that won two all-Ireland finals, 1956 and 1967. She had also won 13 inter-county titles and 1 inter-province one another little piece of history that is forgotten about because if you ask most people which county in the north (as opposed to Ulster) won the first all-Ireland they will say, Down, referring to the Down senior (male) footballers. Paula, in her own way, was helping to uncover that history and the fact that her mother, and the other women, had been ‘written out of history’. That was why Paula was there yesterday. That was why I was there; we wanted to ensure that her mother and the blanketmen and women would be very definitely included in any project that looks at the history of Ireland. I spent several hours there, most of it sitting waiting as the various members of staff documented and photographed materials. There was a large crowd in attendance, the biggest they had had from any of their one-day events. What was intriguing was that word quickly spread through the staff about this guy who was there with items made from a prison blanket and one by one they came over to introduce themselves. Some wanted photos taken with me. One told me of how as a child of 7 years of age she went to school in Galway wearing a black armband during the hunger strike. Another told me of his father teaching art in Portlaoise Prison. Another told me that he thought H3 the best film ever made! Another asked me my views on ‘Maze’, the recently released film about the 1983 escape from the H-Blocks. All of them thought the project was amazing and wanted to know how to get a copy of the calendar. This was the second time in a few hours I had been referred to as ‘sir’ and the term was not used by way of deference or inferring authority but out of respect and affection. The tile of Bobby’s poem came to me, ‘I am Sir, you are 1066’, but here were people in the Titanic Quarter, Belfast speaking to me ‘wearing the blanket’ and addressing me as ‘sir’. But what was the most touching for me, and actually quite emotional, was that the woman had used the word ‘elegant’ to describe how I looked. It’s not a word I use often and yet it is the word I use in the text in the calendar to describe the photos I wanted to take. I wanted elegant photos. I wanted the subject of those photos, the men and women of the blanket protest, to look elegant; standing erect in the beautiful surroundings of nature, their heads held high, unbowed, unbroken, proud of the role they had played in our liberation struggle, proud to ‘wear the blanket’ and to tell their story to a new generation.